Looks like Google is still not done upgrading, tweaking and changing its search engine as new features keep popping up every now and then. As of today, Google has once again changed its interface a little, placing location and location based search on the fore front of its search engine. 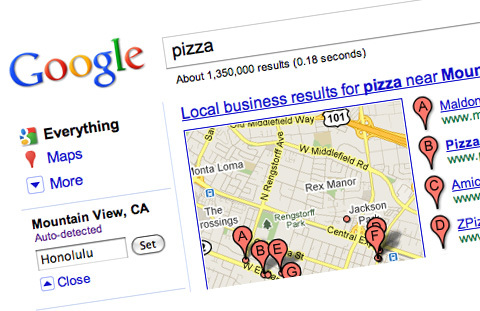 Announcing the change on their blog, Google stated that the user location setting is moving to the left hand panel of the search results page which will automatically detect your location and produce customised, local results for searches like “pizza” or “gyms”. All such searches will provide you with a list of your local pizza outlets or gyms in the nearest vicinity. Users can also search for services near a different location by just typing the city name or its zip code and the engine will adjust results based on that location. While nothing has changed in the back-end of location-based search, the simple fact that Google has prominently placed it on the left-hand side, where millions of eyeballs will catch it, is not a small change. Location based services are the biggest rage around the world and they make sense when it comes to search engines as a user from any corner of the globe gets results relevant to his/her surroundings and not general information about a topic. The change rolls out starting today and will be available to users in 40+ languages sometime soon.